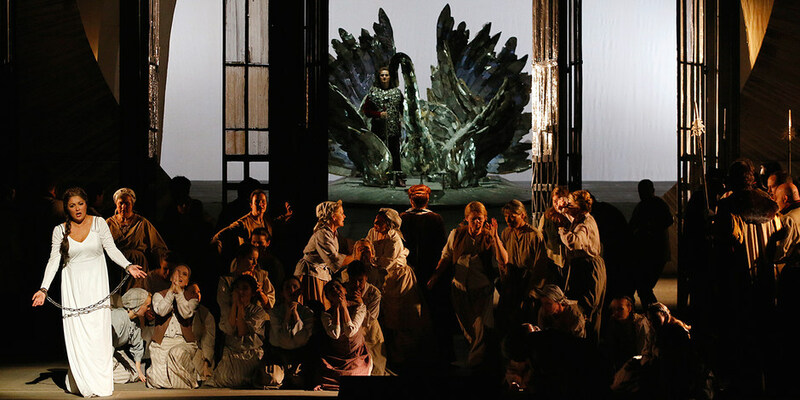 A film of Anna Netrebko and Piotr Beczala in Lohengrin at the Sempoper Dresden has appeared. Perhaps you can find it. The subtitles are in German. It is a traditional production, though I admit the swan is rather hideous. I love the version with Jonas and Anja showing nazis vs hippies in t-shirts, but the baritone/bass casting here is better. Tomasz Konieczny as Friedrich played the sheriff to Jonas and Nina's La Fanciulla del West. He makes a great bad guy. Friedrich and his wife Ortrud are trying to take over Brabant. They have disposed of the heir and are accusing his sister Elsa ("von Brabant" is her title) of killing her brother. She calls for a knight to save her, and he appears. At least we get to see the swan in this production. As in any Wagner opera, more time is spent yammering about how the nameless knight and Friedrich are going to fight than is spent in actually fighting. Nameless knight wins but does not kill Friedrich who slinks off with Ortrud. The main arias of this act, "Elsa's Dream" by Netrebko, and "Mein lieber Schwann" by Beczala are masterfully performed by our stars. The King is also excellent. The secondary characters are far better here. Herlitzius is a very intense Ortrud. Friedrich and Ortrud get together to blame one another for the fiasco. He blames her for bringing God down on him and she argues it is his cowardice that is to blame. Eventually they unite and swear revenge. This dark scene is very effective. She calls on Freie. The scene with Elsa and Ortrud is absolutely glorious. I am enjoying Thielemann here as well. This is more beautiful than any Wagner I've heard. Then they go back to a public scene with chorus and unrelenting pomposity. The silliness of a modern production takes the tension away. The action is people parading back and forth and standing and shouting. Perhaps for Netrebko it needs to be this heavy. This starts with the wedding which in this production is combined with a coronation of Elsa. The duet scene is a masterpiece, a progression of emotion which seems to evolve naturally. Then suddenly Friedrich bursts in and Lohengrin kills him. Elsa reaches out her hand to grasp the sword, whether to stop Lohengrin or to help in the murder is not certain. Lohengrin knows the declaration of his identity is now to be part of a trial. This performance is for those who believe in traditional productions. This one is clear in every detail. If you wanted to know what Lohengrin is about, this is the one for you. But we weren't here for the production. Anna and Piotr were excellent together, formal in a way that suited the formal production. Anna's German diction is acceptable. I have to say I loved it. And Herlitzius was absolutely hair raising. The women's chorus has gone home before the bows.